To purchase this product, view Unique Expressions's about page and see if Unique Expressions is selling products online. 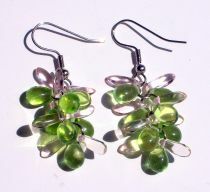 Beautiful czech glass beads in translucent pink and green comprise these pretty clusters. These measure ~1 3/4" from top of hook to bottom. Hooks are surgical stainless steel. This item was created by Unique Expressions. View Unique Expressions's About page.